​Thirteen dead monkeys at a Texas lab have led to the filing of a complaint with federal regulators and the opening of a probe that could end with the research facility facing hefty fines or more. Two macaques succumbed to hyperthermia in an overheated animal housing room in September due to a faulty thermostat inside the Alice, TX lab run by Covance Research Products, a United States Department of Agriculture inspection report revealed. Eleven more animals died roughly one month later, due to a failure with the thermostat’s override switch. The Associated Press first reported on Monday this week that a spokesperson for the USDA said the agency is considering taking action against Covance, a drug development services company that conducts pharmaceutical testing on animals. Stop Animal Exploitation Now, an Ohio-based animal rights group, has filed a complaint with the USDA asking for fines to be lobbied at Covance. Feds could decide to suspend the lab or shut it down entirely, pending the agency’s decision. USDA regulators don’t allow for primate housing rooms to get any hotter than 85 degrees Fahrenheit for more than four hours, the USDA report states. However, Covance failed to take action after the first thermostat issue became apparent in September and proved to be costly. "Covance takes very seriously our ethical and regulatory responsibilities to treat research animals with the utmost care and respect," the New Jersey-headquartered research center said in a statement to AP. According to the USDA report, corrective measures are now in place at the Alice lab – including manual temperature checks twice during the night, and close monitoring by employees during the day. Additionally, the agency says Covance plans to install temperature alarms in all animal housing rooms. But Michael Budkie, executive director of Stop Animal Exploitation Now, wants the research group to face fines after what was anything but an isolated incident. “I am outraged by the serious violations of the Animal Welfare Act which have occurred at the Covance Research Products facility in Alice,” he wrote in a complaint to the USDA filed on Monday this week. "The negligence which allowed primates to literally be cooked to death on two separate incidents deserves the maximum penalty," he told AP. 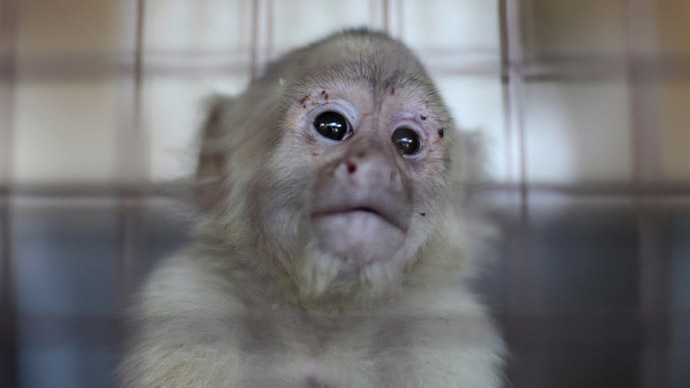 "These monkeys suffered horribly, dying unnecessarily, and this facility should pay the price." Tanya Espinosa, a spokesperson for the USDA, said the agency’s Animal and Plant Health Inspection Service division will review the lab’s history and determine what action to take, if any, against Covance. “Many other monkeys from the facility are missing fingers or toes, or have broken digits or damaged ears,” Budkie wrote to the USDA in 2011 after receiving records from the University of California, San Francisco about animals purchased from the Alice lab. “Out of 31 animals discussed in these records, nineteen of them had an injury of one type or another,” amounting to a rate of 61.3 percent. In 2012, Budkie again urged the USDA to act after records revealed that two pigtail macaques had died at the Alice facility from tuberculosis, and another from a form of polio. Now with the passing of 13 cynomolgus monkeys in only a few weeks’ times, Budkie insists the USDA take action over the latest two lapses.